Angry Horse Brewing is set to open it's doors in February 2017. They wanted a social media strategy to build awareness and anticipation prior to opening. The brewery also wanted a grand opening strategy and an ongoing strategy post opening. By now any business with a Facebook page has realized due to the algorithm it can be really hard to get your content seen without putting dollars behind it. With the right strategy though we can increase the ability ti be seen. How? By creating content that resonates with your audience, encourages sharing and is content your audience wants to see. You can see the difference in organic (non-paid) reach of the brewery's content before and after using the strategy I crafted specifically for the brand. 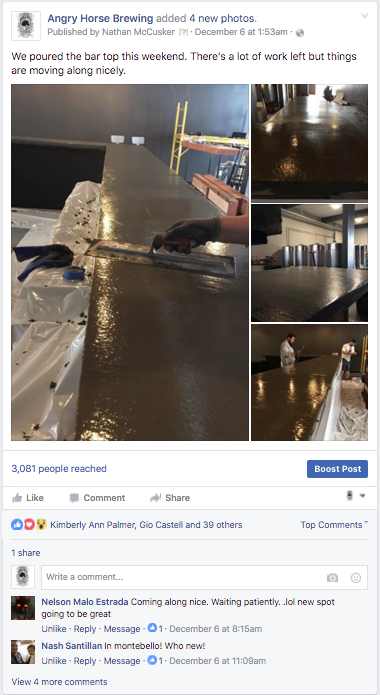 The goal wasn't just to get more people to see the brewery's content we wanted them to also engage. When people engage they are getting involved with the brand and becoming a part of the brand. The ultimate goal is when people start talking about your brand. We want to encourage, create and build advocates for your brand. We wanted to build excitement around the grand opening which fans started to mention. Building support before the brewery even opens their door creates an ROI and helps ensure the brand will have a successful launch and business.